"Now when Jesus was born in Bethlehem of Judaea in the days of Herod the king, behold, there came wise men from the east to Jerusalem, Saying, Where is he that is born King of the Jews? for we have seen his star in the east, and are come to worship him. When Herod the king had heard these things, he was troubled, and all Jerusalem with him. And when he had gathered all the chief priests and scribes of the people together, he demanded of them where Christ should be born. And they said unto him, In Bethlehem of Judaea: for thus it is written by the prophet... Then Herod, when he had privily called the wise men, enquired of them diligently what time the star appeared. And he sent them to Bethlehem, and said, Go and search diligently for the young child; and when ye have found him, bring me word again, that I may come and worship him also. When they had heard the king, they departed; and, lo, the star, which they saw in the east, went before them, till it came and stood over where the young child was. When they saw the star, they rejoiced with exceeding great joy. And when they were come into the house, they saw the young child with Mary his mother, and fell down, and worshipped him: and when they had opened their treasures, they presented unto him gifts; gold, and frankincense and myrrh. And being warned of God in a dream that they should not return to Herod, they departed into their own country another way.” Matthew 2:1-11. Now this is a very interesting passage, since it provides such a positive view of astrology, often lumped with sorcery and witchcraft in the Bible. The three wise men or Magi are clearly astrologers and in some modern translations of the Bible, clearly identified as such. And while the use in Matthew is focused on the many foretellings of the birth of Christ, of course, the fact that it was astrologically predicted means that astrology works! Note that in this passage, astrological prediction and prophecy as well as dream interpretation all combine to give a complete view of events. It's interesting to compare this with Luke, "And there were in the same country shepherds abiding in the field, keeping watch over their flock by night. And, lo, the angel of the Lord came upon them, and the glory of the Lord shone round about them: and they were sore afraid. And the angel said unto them, Fear not: for, behold, I bring you good tidings of great joy, which shall be to all people. For unto you is born this day in the city of David a Saviour, which is Christ the Lord. And this shall be a sign unto you; Ye shall find the babe wrapped in swaddling clothes, lying in a manger. And suddenly there was with the angel a multitude of the heavenly host praising God, and saying, Glory to God in the highest, and on earth peace, good will toward men. And it came to pass, as the angels were gone away from them into heaven, the shepherds said one to another, Let us now go even unto Bethlehem, and see this thing which is come to pass, which the Lord hath made known unto us. And they came with haste, and found Mary, and Joseph, and the babe lying in a manger." Luke 2:8-16. 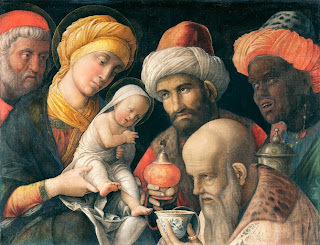 Note that the astrologers knew that Christ was to be born from the stars, but didn't know where, while the divine revelation given by the angels to the shepherds is complete in all details, "born this night in the City of David...is Christ the Lord." What these accounts of the birth of Christ reveal is that astrology and prophecy are ultimately not antagonistic, but that they are different means to understand not just material reality, but also to approach the One. There is, of course, a tremendous amount of interesting material available on the Three Magi.